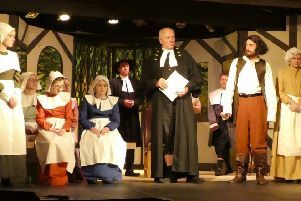 Morpeth St George’s Community Players certainly adhered to the old theatrical adage that the show must go on when they presented their spring offering A Murder Booked in the Church Hall. The group, beset by illnesses over recent weeks, put their problems firmly behind them and turned in a highly commendable performance as they tackled a three act thriller by local playwright Eileen Clark. On opening night, the captive audience were hooked, as well as booked, by the strange goings on in the Graham household, which led to the untimely death of family friend George Watson, who was played by Jared Johnson. David Keily, as Stephen Graham — a successful writer of mystery novels, and Martin Farrington, who grows in confidence with every performance, as burglar David Shaw, were totally convincing in their roles, whilst Charlotte Dodson gave a distinguished and assured performance on her debut as Eve Russell from the local constabulary. Sue Elliott and Carmel Adamson also excelled as Jessica Graham and George’s sister Sally in a script which had a truly compelling finale. Margaret Johnson was the prompt. The group now begin preparations for their November choice — A Chorus of Disapproval, by Alan Ayckbourn.